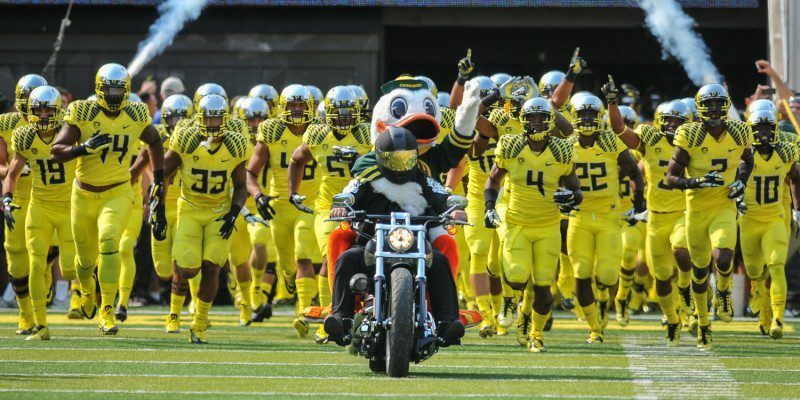 Oregon’s haul in the early recruiting cycle has now reached a total of six prospects with the addition of offensive lineman Jacob Capra (3-Star/Auburn, CA) and defensive back Troy Warner (3-Star/San Marcos, CA). Secondary coach John Neal may have uncovered a future star in Warner. The scrappy 6-foot-0, 185 lb. defender has the raw talent and work ethic that can turn a mid-level prospect into an elite defender once he starts under the tutelage of both experienced players and coaches alike. “They are never standing around; they are up tempo. I love the energy in practices from the players and the coaches,” said Warner. A two-way threat, the talented prep also lines up at wide receiver. Don’t be surprised if he plays some snaps on offense once in Eugene. The aforementioned Capra will also be swapping positions as a Duck. He is poised to have a breakout senior season, but will do so with Eugene on the his mind. At 6-foot-5, 275 lbs., Kapra fits the mold of Oregon’s athletic front five. Playing in an uptempo prep offense, Kapra has had plenty experience reacting immediately on the snap and bulldozing a trail for the skill positions. To view Kapra highlights, please click here.